One of my favorite things to do is change up recipes to make the dishes a lot easier to prepare. 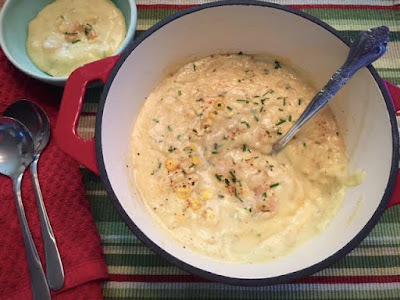 Like this recipe for an amazing shrimp and potato corn chowder that I came across today. The original recipe indicated it took 8 hours to make this. I made it in less than 30 minutes, and it is fantastic! Seasoned perfectly, this creamy chowder, with bites of shrimp and corn, will very much please your palate and have you coming back for more! - 1/2 lb. medium shrimp, peeled and deveined - Tip* if you don't have a great place to get fresh shrimp, you can also buy frozen already peeled, deveined, and cooked shrimp as well. In a medium to large sauce pan or dutch oven, heat chicken stock over medium-high heat. Add potatoes, salt, pepper, thyme, and one cup corn. Stir until potatoes are soft. Transfer to a blender and with the lid slightly open to allow steam to escape and holding a towel over the top, begin blending on low and increase the speed slowly until the potatoes and corn are completely blended. Return mixture to the sauce pan and add half and half, one tablespoon of butter, the remaining cup of corn, and the Old Bay seasoning. Turn down heat to low. In a skillet over medium-high heat, add remaining 1 tablespoon of butter shrimp. Sauté until shrimp turn pink and are done, stirring occasionally. Divide the soup into bowls and add shrimp on top along with a little more chives for garnish. Enjoy! If you'd like a printer-friendly version of this recipe, Click Here.